SUPA KiD's Blog: Style Icon say whaaa?! 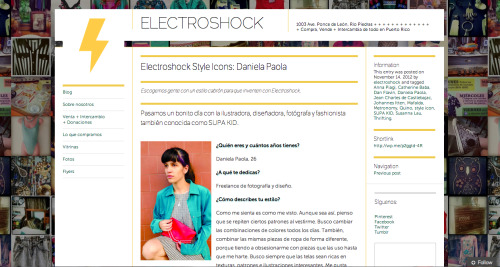 Electroshock featured myself as their latest Style Icon, which of course makes me red with embarrasement, 'cuase Im usually the one behind camera! Still, I love experimenting and having fun with clothes. We spent an awesome day of looking though racks of clothes and playing with many different outfits. I loveeeed it! They asked me many questions about the things I wear. They are an awesome vintage/thrift store that sell the most amazing clothes. A lot of the things that I love to wear are from the finds I’ve been lucky to spot. Check ‘em out now!!! Thanks a bunch guys! :D:D:D You can read the interview here!